News of Samsung’s expected drop in profit is spreading quickly. The well-known electronics manufacturer is seeing intense competition. 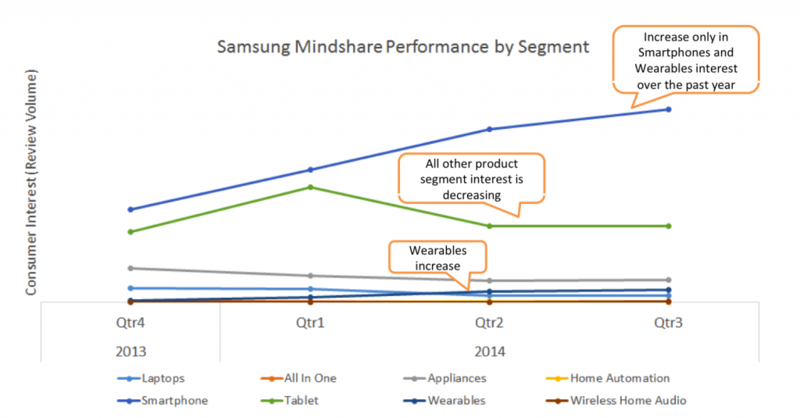 Samsung is losing global mindshare in all product sectors aside from Smartphones and Wearables. Perhaps most surprising is the loss of mindshare in sectors that Samsung has historically held a strong market share in, like appliances and tablets. Due to this far spread loss of consumer interest, they have been striving to beat Apple and others in the smartphone market to maintain profit, but in doing so, they are spending precious time and money promoting their Galaxy S5 and bashing Apple. Both high-end brands like Apple, and companies creating cheaper smartphones with similar capabilities and Android software, like the Chinese startup Xiaomi are gaining mindshare as Samsung losses it. The Verge reported an expected “big blow to Samsung’s bottom line due to” these competitive stresses. In an effort to stay ahead of the competition, Samsung has launched ad campaigns mocking Apple coupled with aggressive promotions for their new Galaxy S5 to stave off potential customers waiting for the much anticipated larger screened iPhone 6. Despite their focus on smartphones, Samsung is losing global mindshare. As displayed in the chart above, Samsung’s aggressive tactics have noticeably driven consumer interest in smartphones and wearables, but interest in all other Samsung product sectors is decreasing. On the product level, demand for the Galaxy S5 is robust. With that however, the Galaxy S4 and the Galaxy Note 3 did not fall off as expected when the newer handsets were announced. In the past, for both Apple and Samsung, this indicated interest in the lower priced, older handsets over the newer higher priced handsets. Smartphones are one of Samsung’s only growing markets, and if consumers continue to put price over novelty, Samsung’s overall gross revenues will be significantly affected. Looking to the Smartphone Market Landscape in China, it is clear that local manufacturer Xiaomi is overtaking both Samsung and Apple. Xiaomi offers smartphones that run on Android software for nearly half as much as Samsung’s fairly similar handsets. Consumers are showing interest in cheaper phones, and with this Samsung and Apple are losing their brand strength abroad. Samsung’s anticipation of lower profits is to be expected. Their brand is weakening as other manufacturers are filling the void of quality at a lower price. While Samsung has had fun sniping at Apple in commercials, these ads have done little to shift the brand from top of mind to top of shopping list. Samsung is losing mindshare, and should be addressing consumer product concerns instead of turning their attention to competitors. Want more insights? Visit us at Argus Insights to subscribe to access our data, personalized analysis, tailored repots, and more!